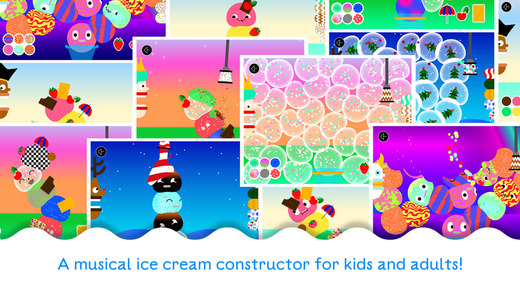 creations FREE for a limited time – Bubl ice Cream – A musical dessert for kids. Kids can create musical ice cream concoctions for six different characters (Santa, Rudolph, a snowman, a pirate, a yeti, or a princess) with this fun app. Kids start by selecting a character. They fill the character’s cone or dish with scoops of ice cream. Then they add a musical sauce and top it all off with berries, sprinkles, cookies, etc. As they work, their creations are arranged into unique musical compositions. Fun for little ones!